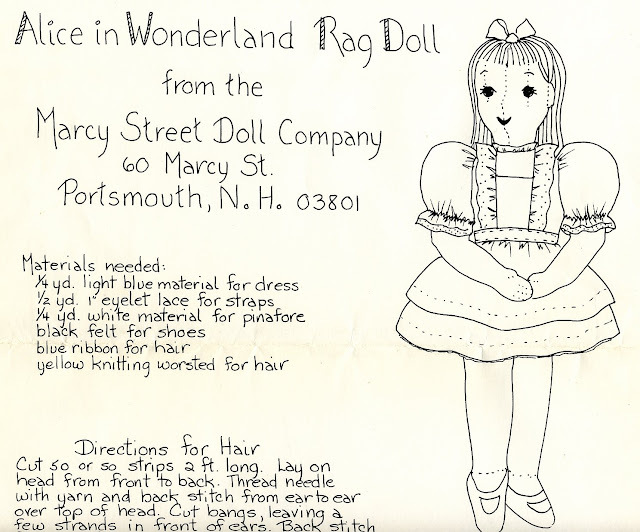 Vintage Cloth Doll Patterns: Fairy Tale Doll Patterns from the Marcy St. Doll Co. 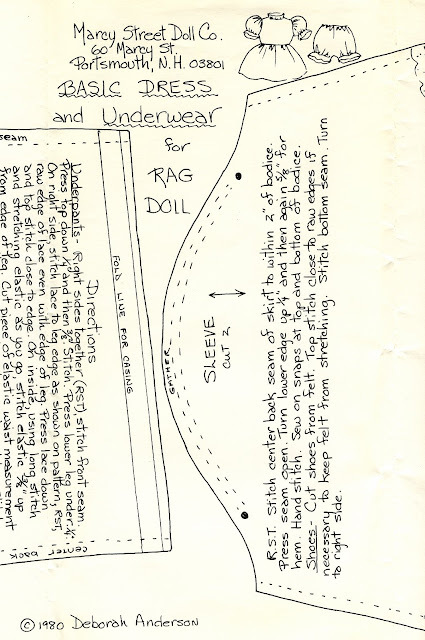 This pattern makes three different fairy tale rag dolls from the same basic pattern. 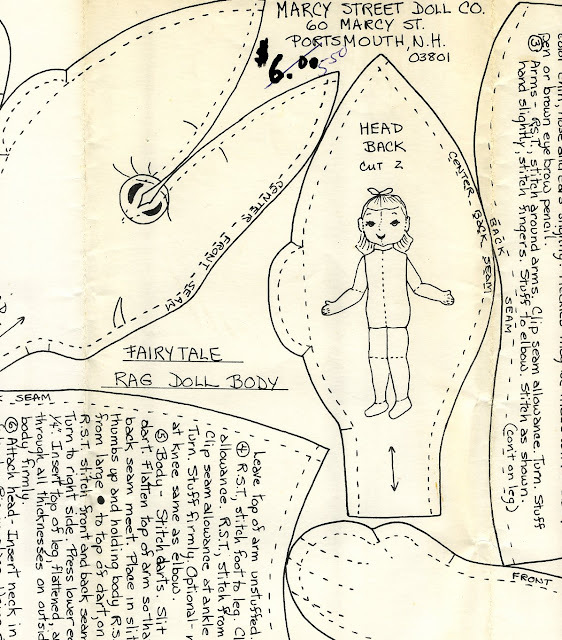 There are five 11" x 17" sheets included; one for the doll, one for the basic dress, underwear and shoes, and one page each to customize the doll as Red Riding Hood, Snow White or Alice in Wonderland. The pattern is copyright 1980 by Deborah Anderson, a cloth doll artist who ran her Marcy St. Doll Shop in downtown Portsmouth, NH for many years. The doll has an unusual construction with a four piece head shaped by forehead darts; darts and inset arms in the torso; and a separate foot piece. The arms have mitten hands with stitching to indicate fingers. Facial features are embroidered, but buttons may be used for eyes if desired. Muslin is recommended for the dolls; their hair is made from yarn. The instructions are clear, but not very detailed. This pattern would be best for an intermediate sewer with some doll making experience. 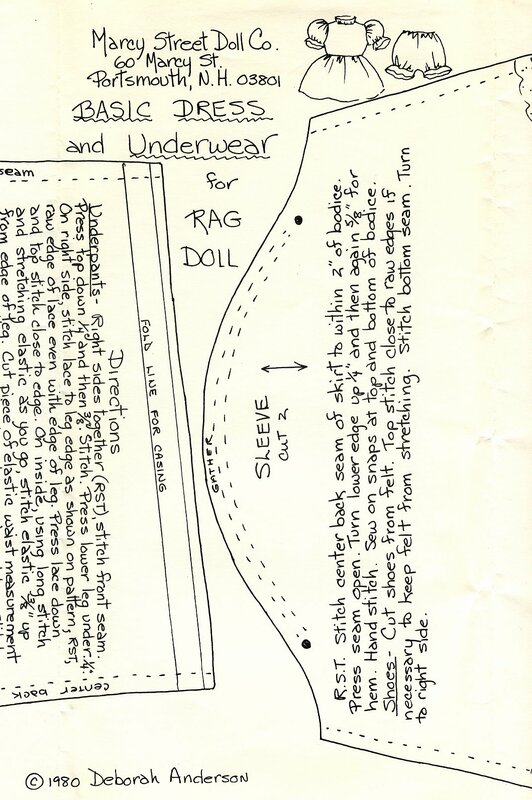 Alice in Wonderland's pattern has a pinafore to go over her dress. Her hairstyle is straight with bangs. Red Riding Hood has a cape with hood. Her hair is styled in braids. Snow White's pattern has a long cape gathered with elastic at the neckline to form a collar. She wears her hair in curls tacked to her head. This is an interesting, but hard to find pattern. I would love to see one of these dolls made up.